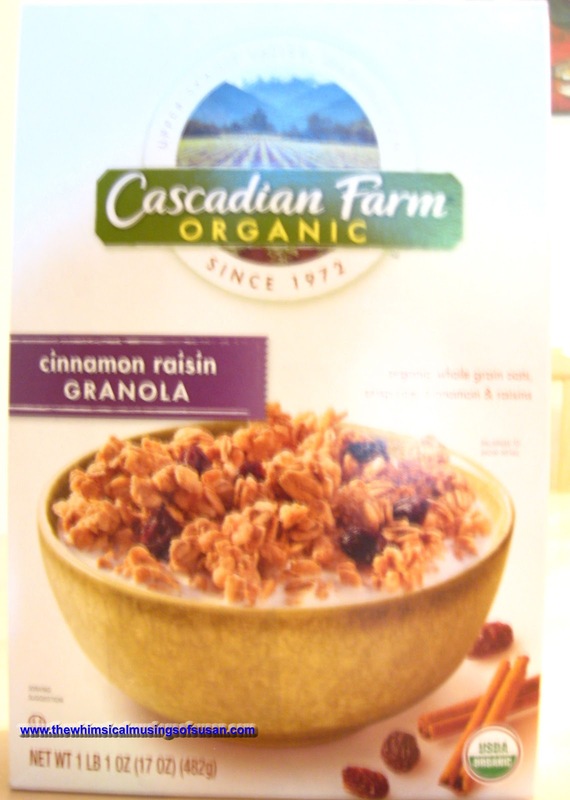 I am writing this review on Cascadian Farms Organic Cinnamon Raisin Granola cereal. It is a USDA certified organic product, which is packaged in a 1 lb 1 oz. box. One box of this product costs roughly $3.30 - $4.20 at a retail supermarket. The cereal contains the following ingredients: whole grain oats, sugar, rice raisins, honey, sunflower oil, sea salt, molasses, baking soda, cinnamon, malted barley extract, and vanilla extract. One 2/3 cup serving is 210 calories, with 3g of fat, 0g cholesterol, 42g of carbohydrate, and 5g of protein. Cascadian Farms appears to be a socially responsible company, which partners with family farms, and does what it can to help the environment. Not only does the company make sure that its products are grown without genetically engineered ingredients and fertilizers, it packages the cereal in 100% recycled paperboard. You can look at the cereal and see most of the raw ingredients and that it has been through minimal processing. In my opinion, this cereal is the best tasting of its kind. Based on prior experience with packaged health food products, I didn’t expect for such a healthy, natural cereal to be so delicious. It tastes so good that I found myself going back for a second serving. Even my seven-year-old nephew, who is a junk food junkie, loves it. This cereal is a little bit on the sweet side, though. If you're not into to sweet tasting cereals, then this product might be a deal breaker. For most of my life, I have been eating Kellogg’s, General Mills and Post branded cold cereals, most of which are sugar-packed junk. The major food manufacturers try and trick us into the notion that it is ok to eat their cereals, because they contain vitamins. For the most part, many of us have rationalized eating crap cereals, such as Fruit Loops and Pops. In reality, you’re consuming a bunch of artificial flavorings, colorings, and preservatives along with a dose of synthetic vitamins. I can’t even pronounce some of the chemicals that are listed in the ingredients labels of these types of cereals. Only God knows what the long term effects are of those chemicals in our bodies. The closest that I have ever gotten to healthy cold cereals is Post Grape nuts and Kellogg’s Raisin Bran. Grape Nuts are too hard and too crunchy and they don’t taste very good. Raisin Bran tastes alright, but I don’t like it that they become mushy after sitting in milk. I also, eat Quaker Oats when I am in the mood for a hot breakfast. The only negative comment that I have about this cereal is in regards to the cost. If you buy a box of Cascadian Farms cereal at the supermarket, you are looking at a price of about $4.00 per box. Cereals in general are quite expensive, but I feel like I am getting a little bit less for my money, due to the small size of the box. The other side of this is that organic products are usually more pricey, anyway. I understand that it is very expensive for farmers and manufacturers to produce organic foods. They have to price their products in such a way to cover their costs and make a profit. So, if buying organic products is a must for you, then paying more money for “less”, needs to be factored into your buying decision. Now that we are moving into a new year, I am making an effort to wean myself off of foods that I know are not good for me. One of my relatives is going through some serious health issues and this has had a great impact on me. I see how she is pretty much at the mercy of the healthcare system. Some days is a struggle and she feels pain at times. I don’t want this to happen to me. So, I am trying to embrace a more healthful lifestyle while I can. I think that this cereal will help me to achieve my objective. Cascadian Farms Cinnamon Raisin Granola cereal gets the thumbs up from me.